New studies show that the seven planets orbiting the dwarf star TRAPPIST-1 are made mostly of rock, and some could hold more water than Earth. The quest to see if there's life in other solar systems led to the astonishing discovery over a year ago of seven Earth-sized planets around TRAPPIST-1, an ultra-cool dwarf star less than 40 light years from Earth. The scientists who made this remarkable find then went on to further explore the secrets of these planets, resulting in a number of new studies that give insight into their nature and make-up. As astronomers search for potentially habitable planets around other stars, the EU-funded SPECULOOS project's focus on the smallest and dimmest neighbouring stars has a purpose. The size and faintness of these ultra-cool dwarf stars make them ideal for studying their orbiting planets with the technology available. But the TRAPPIST-1 planets also have other advantages. 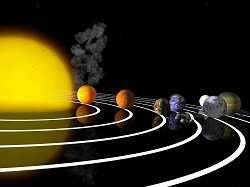 Their short orbital periods range between 1.5 and 18.7 days, offering many opportunities for observation from Earth as they pass in front of their star. Taking advantage of the qualities of the TRAPPIST-1 planetary system, researchers used terrestrial telescopes TRAPPIST and SPECULOOS and space telescopes Hubble and Spitzer to intensify their study of the planets' nature and potential habitability. Their observations yielded more accurate estimates of the distance, temperature, radius and mass of the dwarf star. This is an important step in gaining a better understanding of the planets orbiting it. Other explorations revealed the seven Earth-sized planets of TRAPPIST-1 to be rocky overall and have more water than Earth. In fact, based on their densities, up to 5 % of the mass of some of these planets could be water, which is about 250 times more water than is found in Earth's oceans! Studies also showed that the hotter planets closest to the dwarf star may be surrounded by dense, steamy atmospheres, and the more distant ones could have icy surfaces. More importantly, the absence of a hydrogen-rich atmosphere in three of the planets suggests they're not gaseous and inhospitable like our solar system's gas giants. This further supports the theory that they may be similar in composition to Earth, and therefore likely to support life. These discoveries are just the beginning, as astronomer Dr. Michaël Gillon from the University of Liège, Belgium, suggests in an article published on the European Research Council website. The new James Webb Space Telescope that will be launched by NASA and the European Space Agency in early 2020 will allow scientists to probe deeper into the atmospheres of the TRAPPIST-1 planets, "notably to measure their composition and detect possible molecules of biological origin," says Dr. Gillon. "In the temperate – and potentially habitable – Earth-size regime, SPECULOOS's detection potential should be significantly better," Dr. Gillon notes in 'Science Magazine'. "The next years are going to be very exciting!" Yet, the hunt for more information on this star and its planets doesn't mean that the search for other potentially habitable systems has been abandoned. As part of his SPECULOOS research, Dr. Gillon will be using the partly EU-funded observatory he's setting up in Paranal, Chile, to study around a thousand stars as he searches for other planetary systems like that of TRAPPIST-1. With the successful detection of the TRAPPIST-1 planets, SPECULOOS (SPECULOOS: searching for habitable planets amenable for biosignatures detection around the nearest ultra-cool stars) is continuing with its goal to discover planets outside our solar system that could support life. As much as I mock the starry-eyed assumptions that gush from these articles with all the believably of National Enquirer Headlines? I must admit that this work is important to proving the narrow range of possibilities for discovering a Living World. Once the criteria for realistic expectations is set? We can then concentrate resources on those few believable possibilities for an LW. Greatly increasing our chances of finding, verifying and confirming the existence of another planet with a detectable biosphere.